Emmet Bradley's early goal proved the match winning platform for Damian McErlain's first league victory as Derry senior manager with the Oak Leafers holding off a vastly improved Offaly to win by five in Celtic Park. In what was a real relegation 'four pointer', Derry got exactly the start they wanted, racing into a 1-06 to no score lead inside the opening 14 minutes but the worry was they failed to build on that. That high intensity opening quarter looked set to kill the game before it even got started but Derry's attempts to manage the remainder of the half merely allowed Offaly a foothold in the game and Stephen Wallace's team took full advantage, cutting the home lead to only four points by the half-time whistle. Derry made three changes from the team named to start the postponed fixture last week with Michael Bateson, Benny Heron and Padraig McGrogan in for Niall Keenan, Ciaran McFaul and Liam McGoldrick and they should have put the game away in the opening exchanges. With McGrogan sweeping, Bateson, Heron and Emmett Bradley were cutting through the Offaly defensive lines at will in the early minutes and Derry should have had more than Bradley's 12th minute goal to show for it. However the longer the half wore on, the more influence the visitors exerted with Derry's kick-out proving problematic in the difficult underfoot conditions. Bradley set the tone for the first quarter with a first minute free, a score Bateson added to 60 seconds later. Bradley then cut in long the by-line to first Derry's third point before Niall Toner shot straight at Offaly keeper Barry Rohan with the goal on after a lovely solo burst forward. Terence O'Brien and Enda Lynn exchanged passes for the former to grab his first score and when Toner tapped over a free Derry were five to the good and cruising inside 10 minutes. Cruising looked like becoming 'cigar time' one minute later when Lynn's initial break saw his feed the supporting Heron who in turn picked out Toner inside. The forward stepped inside and squeezed his shot past Rohan. Whether it would have made the net or not is debatable but Bradley was on hand to dispel to doubt by tapping home. Lynn tagged on another point and Derry looked home and hosed with a nine point lead before 15 minutes had elapsed. Perhaps that was that mindset that set in because that Lynn point would be Derry's final of the first half as Offaly dominated the remaining 21 minutes. Bobby O'Dea took Offaly's first score with marauding corner-back Declan Hogan added another. Derry still carried a threat and it took a brilliant goal-line clearance from Offaly full-back Paul Conway to stop Toner's shot hitting hitting the net with Rohan beaten. The visitors had already lost Shane Nally to an early black card but it didn't seem to faze them as further points from Nigel Dunne (2) and another from Hogan took it to 1-6 to 0-5 with Offaly also passing up two notable goal chances. Two quick Offaly points upon the restart made it seven successive scores from the visitors against a Derry side who ended 27 scoreless minutes thanks to a point from Enda Lynn. the introduction of Mark Lynch and James Kielt gave the home side some much needed impetus with Kielt immediately making his presence felt with a lovely score from Lynn's pass. A Bradley free looked to have steadied the Derry ship but not so as Bernard Allen and Nigel Dunne (2) hit three without reply to leave it 1-10 to 0-10. The visitors were in the ascendancy with Bradley's free only temporary respite for a Derry team that was losing its shape and still struggling with kick-outs. And it took a last minute Terence O'Brien tackle to force Dunne to shoot across the face of goal and just wide while Allen saw his effort for a point rebound off the posts. Offaly substitute Shane Tierney did reduce the deficit to two points again but Bradley immediately responded with a close range free as Derry clung to their three point lead. Offaly maintained the pressure but a superb Danny Talon point from the right arrived just when Derry needed it, as did a needless red card for Offaly full forward Anton Sullivan after he was booked twice in 60 seconds. A man to the good, Derry held on with Toner striking over the clincher to give McErlain a first league win at Derry manager. 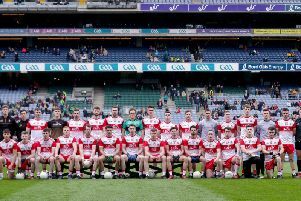 Derry: Oan Hartin; Michael McEvoy, Kevin Johnston, Ruairi Mooney; Michael Bateson (0-1), Carlus McWilliams, Conor Doherty; Conor McAtamney, Emmett Bradley (1-5,3f); Padraig McGrogan, Enda Lynn (0-3), Benny Heron; Peter Hagan, Terence O'Brien (0-1), Niall Toner (0-2, 1f). Offaly: Barry Rohan; Declan Hogan (0-2), Paul McConway, David Brady; David Dempsey, Sean Pender, Niall Darby; Peter Cunnigham, Craig Dunne; Bobby O'Dea (0-1), Michael Brazil, Shane Nally; Bernard Allen (0-2, 1f), Anton Sullivan, Nigel Dunne (0-7, 5f).